Industry experts from the National Retail Federation, Boston Retail Partners, and Forbes are in agreement. Retail is entering a new era. In the home furnishings industry, in particular, it was once hard to imagine a marketplace where revenue was so greatly influenced and largely generated through eCommerce and mobile. That day is here. Not only should retailers envision this, but it is critical to their future success to strategize for these channels today. For many retailers operating in traditional environments, this dynamic market brings uncertainty about how to prepare retail businesses to capitalize on changing consumer purchasing behavior. STORIS developers have been hard at work to create a Unified Commerce solution to help home furnishings retailers capture today’s shoppers and maximize their revenue potential. Unified Commerce is the strategy of the future. Let’s visit why it’s important for a retailer’s business. So, what exactly is Unified Commerce? Every interaction customers have with your brand must be seamlessly integrated, from personal technology to the technology in your showrooms. This interaction must provide a pleasant experience and convey your brand message. One of the questions you may be asking yourself is: what is the difference between Unified Commerce solution and Omnichannel retailing? Historically speaking, as different channels of retailing became widely utilized, many retailers began to build out their strategies for these channels using disparate technologies. 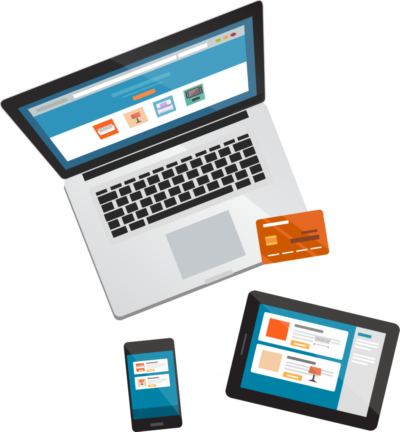 The omnichannel approach commonly sees a separation between a retailer’s in-store and online presence. Today, in order to maximize efficiency and increase information transparency, Unified Commerce calls for one “unified” technology platform. Unified Commerce is designed to best serve today’s consumer, who is shopping their favorite brands across multiple touchpoints. Unified Commerce is about creating a seamless experience, so that no matter where and when they shop your brand, they can always pick up where they left off without missing a beat. In home furnishings specifically, it’s estimated that around 90% of purchasing journeys begin with an online search, yet the vast majority of purchases are still happening at the store. Savvy customers are doing their research before choosing 1-2 destinations to visit in person. That means your online information needs to be compelling and consistent with your in-store experience to win the customer’s business. STORIS’ Unified Commerce Platform consists of 5 central components. Click on each to find out about their functionality and benefits. Interested in learning even more about Unified Commerce? 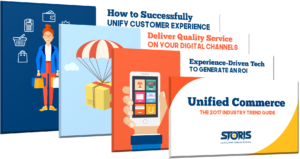 Our Guide to Unified Commerce provides a deeper dive into this chief retail strategy.